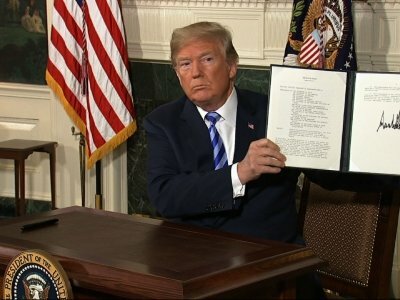 WASHINGTON (AP) — President Donald Trump warned Iran on Wednesday against resuming its nuclear weapons program, a day after announcing that he was withdrawing the U.S. from the landmark Iran nuclear deal. Trump also pointed to Iran’s actions in countries including Syria and Yemen. Trump also left open the possibility of a new deal, and told reporters Wednesday: “We’ll make either a really good deal for the world or we’re not going to make a deal at all. He predicted Iran would choose to negotiate eventually, or face consequences.